In 1953 the Chicago scientist Stanley Miller created a small enclosed model of a primitive and sterile planet Earth. The ground he made of primal rocks, and the air space he filled with hydrogen, methane and ammonia to reflect the prevailing conditions of 4bn years ago. 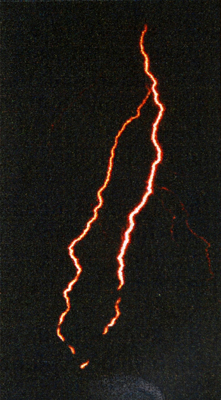 He then introduced electrical discharges to represent lightning, and in fulfilment of his wildest hopes the experiment produced an abundance of amino acids, the primary component of the proteins that comprise living cells. This major discovery firmly established the principle of a self-originating life-form emerging out of the primordial soup of the planet's primal resources. This explanation of the birth of life has held good for forty years and is still widely accepted. Today scientists are examining the molecule RNA (ribonucleic acid) which can develop, evolve and subdivide itself in a manner that would have empowered the nuclei of developing cells even more rapidly in those inhospitable days of Earth's first billennia. RNA translates DNA (deoxy ribonucleic acid) into proteins, while DNA is the control unit that governs the code for genetic inheritance. The Earth and its Moon were formed around 4.5 billion years ago. For the next half billion years the planet was bombarded relentlessly by meteors, asteroids and comets, crunching into the surface like multi megaton bombs. Some meteors were as big as Africa or Australia, and the fantastic energy released would boil whole oceans and fill the atmosphere with steam and detritus for centuries - obliterating both light and heat, and destroying all life forms in their wake. It is now believed that primitive cell life developed, evolved and expired many times before finally succeeding in colonising the planet. Concurrently, however, in the depths of the deepest oceans, protected from the celestial bombardment on the surface and warmed by hydrothermal vents in the ocean floor, other plant life was struggling to develop and survive. Amazingly these early life forms continue to this day, and modern sub mariners have recently discovered new and unknown life forms in the sunless gloom at huge depths, which are supplying invaluable information for mankind's insatiable interest in his primordial past1. 1 In 1994 an Anglo/Russian research ship equipped with a deep water bathyscaphe set out from Southampton to research these extraordinary life forms still surviving from the dawn of history. Some of the oldest rocks in the world, the sedimentary rocks from Greenland, reveal traces of the very earliest plant cells known to mankind, some 3.8 bn years old. A relatively short time later, from 3.5bn years ago, the world's first known fossils appear, featuring primitive algae which are almost identical to algae occurring in Australia today. From 3bn years there followed a prolonged period of cell and plant development evolving into photosynthetic organisms producing, for the first time, oxygen. By 2bn years the earth's atmosphere was oxygen-enriched, the asteroid bombardment had abated and conditions were slowly becoming agreeable to developing life forms. By 1bn years the first multi-celled seaweeds had become established, to be followed shortly afterwards by the profoundly important development of mobility, when primitive life forms learned to vacate their chance dwellings and set off to choose their own. These adventurous semi-animals included jelly fish, starfish and sea urchins, and later trilobites, crustaceans and other exoskeletals. At ½ bn years ago, the first sharks roamed the oceans while amphibians and early reptiles were emerging from their aquatic domain, together with marine plant life, and beginning to colonise the untenanted expanses of dry land. Evolution gained momentum; small reptiles grew bigger - Pterodactyls learned to fly, a momentous achievement that still eludes humans 200m years later. Big Tyrannosaurus Rex began eating his neighbours and grew bigger still, while Brachiosaurus remained vegetarian and outgrew them all. At over 75 tons this veritable monster of unbridled evolution staggered around the world, the greatest tribute to the success, imagination and perseverance of all those dedicated RNA's, DNA's and primary cells of 3 billion years before. Had evolution got out of control? A monster without a brain wasn't going to achieve much, save to get bigger at the expense of his environment. The pace was appearing to have escalated beyond reason; Stegosaurus, the great lumbering, 7m herbivore, was steered by a diminutive 3cm brain, less than the size of our little finger. Some dinosaurs did better than this, but these voracious and often oversized reptiles were soon to become a victim of their own success. Brachiosaurus had reached the point where the increasingly fertile soil, born of generations of primal plant matter (now our fossil fuels) couldn't support his monstrous weight. (Many ended their days stuck fast in mud). The trees couldn't grow leaves fast enough to feed him, and the problems of sexual encounter with his mighty mate amounted to a coupling courtship of thrashing limbs with a combined weight of 150 tons. The damage to their environment would have been severe, while the damage to each other might have been fatal. The dinosaurs lived from 215m to 65m years ago, a long span unparalleled by human standards2, during which great variety marked the march of selective evolution both in plant, marine and reptile life. Trees developed from primitive algae, and birds developed from the dinosaurs, (their scaly legs testify to their reptilian heritage). And then the dinosaurs' 150m year reign came to an abrupt end during which almost every one became extinct. 2Modern mankind's brief history of half a million years (from Homo Sapiens) is dwarfed by the dinosaurs' unbroken reign of 150 million years. The world was now 4bn years old; life had started, proliferated and stalled. We still had no apes, no humans; Darwin's theory of evolution had a long way to go to prove itself. Natural selection respects the genetic changes inherited by life forms who are readily adapting to their chosen environment. Thus fish turned into amphibians, who then turned into reptiles, who turned into birds. Each step reflected the inclination of its precedent, and this precedent was inherited and mutated through the evolutionary process. Those who failed to evolve, generally, failed to survive, although there are notable exceptions to this, especially in the insect world, where ants and bees, for example, survive almost unchanged to this day. Natural Selection, or 'who dares, wins', was the basis of Darwin's 1858 thesis. It caused an uproar in his Victorian England among those god-fearing Christians who wanted to believe, as a dwindling few still do, that life began in a sun- kissed Garden of Eden, with Adam and a somewhat wayward Eve living off a diet of apples. The long gaps in our fossil records leave many unanswered questions in mankind's ancestral lineage - but the evidence tells us that those primitive cells of 3bn years ago had spawned sophisticated oxygenating plants by 2bn years, primitive animal life by 1 bn years, then sharks, coelacanths3 and other sea creatures by 500m years, and overgrown dinosaurs by 200m years. 3The Coelacanth is a very early descendant of the Lobefin genus, ancestor of all land animals. Believed extinct for millions of years, they were rediscovered in 1938 in deep water off Madagascar. Dinosaurs and reptiles were, curiously, ill equipped for their changing environment where heat and cold alternated faster than they could respond. The earliest signs of the hot blooded, multiple heart chamber, fur covered creatures we now call mammals began to develop during the Jurassic (dinosaur) period but it was not until 75m years ago that this genus generally began to expand and proliferate. Mammals were viviparous, bearing live young rather than adopting the egg laying medium chosen by reptiles. Rabbits were among the first of this new life form and have been a very successful species ever since; rabbit fossils have been found which are over 35m years old. Many diverse forms of mammal then evolved, and preliminary distinctions may be made simply on the basis of the subject's footwear. Hoof, paw and claw distinguish the sub species immediately as a grazing, gathering or predatory mammal, and illustrate Darwin's theory of Natural Selection, equipping each species with beneficial and continuously changing physical attributes as variously required by each to master and survive its changing environment. The giraffe is one of many mammals to illustrate this feature, having the same number of vertebrae as all other antelope, yet managing to sustain an enormous elongation of his basic structure to provide for his predilection for treetop fare. By around 50m years ago our ancestor, the wide eyed, short snouted lemur had arrived, complete with stereo vision and grasping hands - a small, nimble, tree dwelling primate who was busy developing unprecedented manual skills in pursuit of his insectivorous and frugivorous diet. Long ages were still to pass before the first fairly unmistakable monkey appeared at around 30m years ago. This was Pliopithecus, a small primate who had the unmistakable finger-and-thumb hands of the genus, and like the lemurs of the old world4 still sported a tail, which he used in balancing and climbing. The diminutive Pliopithecus was the direct ancestor of mankind - and in the ensuing 30m years his line branched into the six distinct sub species we recognise as our animal kin. First came the gibbons, (20m years ago) with their flatter noses and long tails; then came the now tail-less orang-utan (15m years) who were to be followed by gorillas (10m years) humans (at 7m years), pygmy chimps (3m years ago) and finally common chimps (at only 1m years ago). of our genetic relationship expressed in percentage of DNA. The story of evolution is all about invention, modification and adaptation. And it's about extinction too, on a massive scale. Over 90% of all life forms that ever existed have lost the struggle for survival and died their unlamented death - a fate statistically likely to befall humankind. Evolution hosts a catalogue of triumphs and catastrophes. The major evolutionary achievement of humans, the great hairless ape, is but one of the many miracles of development since life first established itself on Earth. The full impact of our long history comes into perspective when we examine the human embryo - to find it still starts life with gills and tail, the reptilian hallmarks of our humble heritage. As the baby grows so do a pair of muscles, lodged on either side of our lower spine, that once wagged our now extinct tail. Informed scientists trace the original ancestry of all mankind to the earthworm order Annelida, who display gill characteristics common to those found in the human embryo. This earthy fact, as much as anything else, tells us of the great gulf that lies between what we know and what we don't... like what lies ahead for us in the next phase of our evolutionary development.